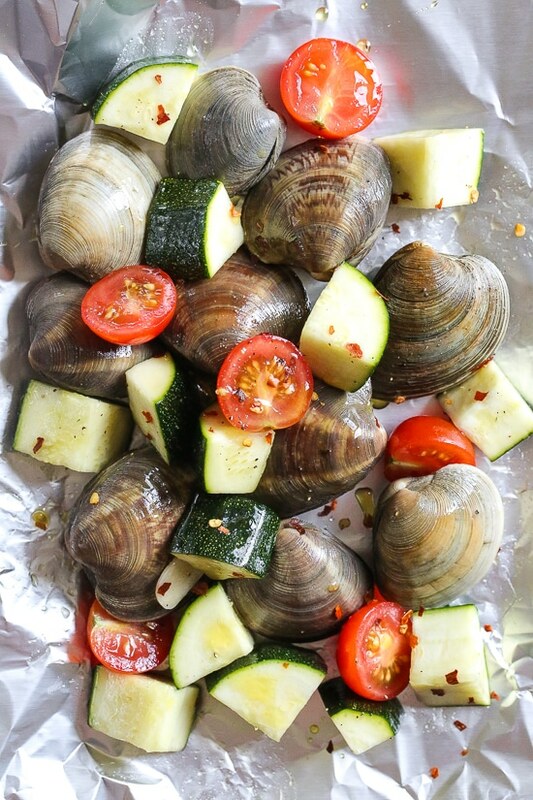 Grilled clams cooked in foil packets with zucchini and tomatoes in a garlic white wine sauce – so fast and easy, perfect to make all summer long! 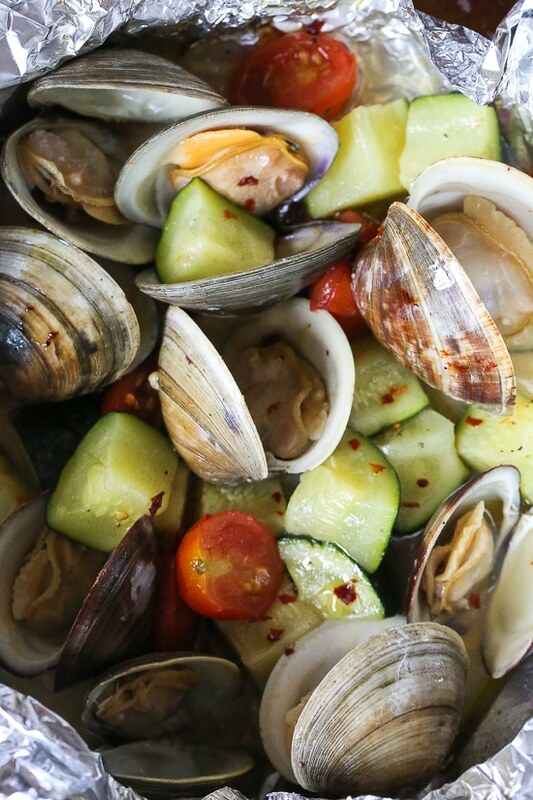 Clams are tender and juicy, and taste sweetly briny. They’re easy to cook by steaming on the grill in foil packets, and are delicious eaten in or out of the shell. If you want a fast meal, this dish take about 10 minutes to make, and even less time to to clean-up! 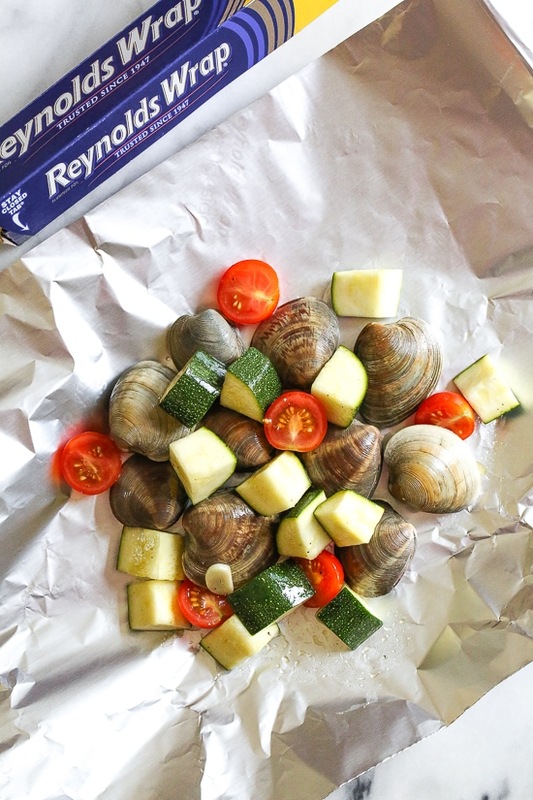 When I mentioned in this Shrimp Scampi Foil Pack recipe, that I’m a 2018 Reynolds Ambassador, I had tons of requests for more foil packet recipes, including grilled clams, which I was happy to create! My youngest is an adventurous eater, and loves clams so we make them all the time. 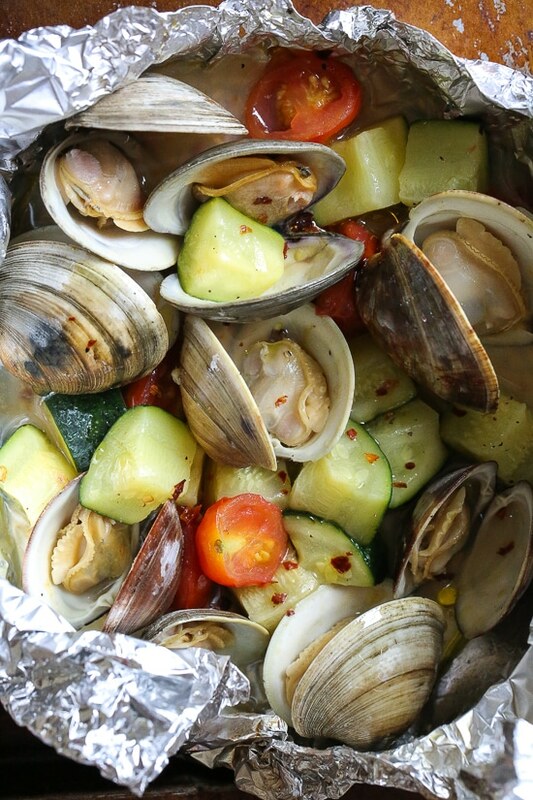 Grilling clams in foil couldn’t be easier, the steam cooks them right in the foil. I wanted this to be a meal-in-one so I added zucchini, tomatoes, garlic and white wine, this turned out delicious!! 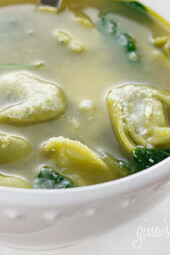 I recommend serving it with some crusty bread to sop up all the delicious garlicky broth this creates on the bottom! 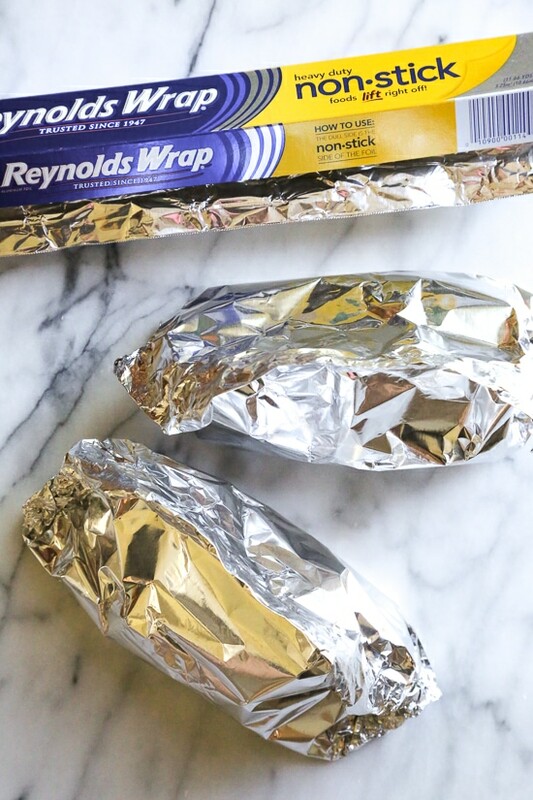 When making foil packets, I prefer to use a heavy-duty foil such as Reynolds Nonstick Foil or Reynolds Wrap Heavy-Duty Aluminum Foil which are heavier gauge than standard Reynolds Wrap, so no breaking or tearing, even with heavier foods and it protects food over direct heat. When purchasing clams, look for small hard shell clams less than two inches across, such as littleneck or cherrystones. They are sold live, you’ll want to make sure there are no cracks in the shell. I prefer to cook them the same day I buy them. If they aren’t open when cooked, add a few more minutes to the cook time. Once cooked, discard any clams that don’t open. Garlic, oil and white wine is the best liquid for steaming clams, in my opinion. If you prefer not to use wine, you can omit, there will still be plenty of liquid from the vegetables. 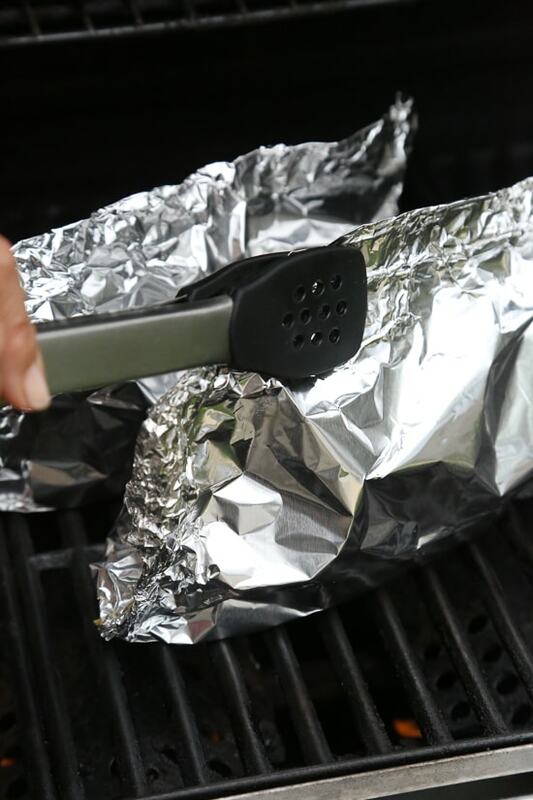 Tear off a 18” sheet of foil. Center the food on the foil sheet. 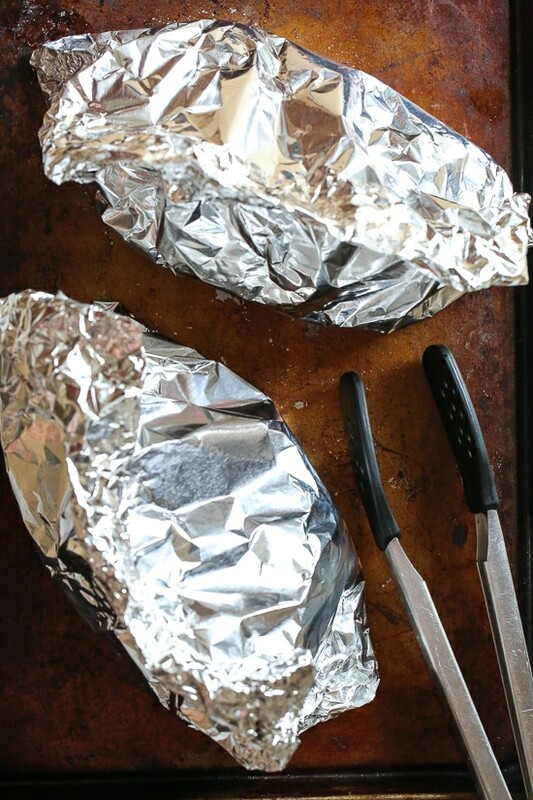 Bring up the long sides of the foil, so the ends meet over the food. Double fold the ends, leaving room for heat to circulate inside. Double fold the two short ends to seal the packet. Grill covered directly on the flame according to directions. To bake in the oven, preheat oven to 425F and cook until the shells open, 8 to 10 minutes. 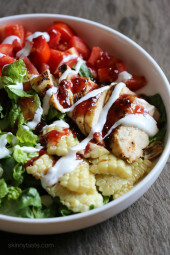 Would you like to see more foil packet recipes? If so, leave a comment and share some of your favorite foil packet dinners! Make foil packets. Tear off 2 18” sheets of Reynolds Wrap Heavy-Duty or Non-Stick Aluminum Foil. In a medium bowl combine the zucchini, tomatoes, garlic, 2 teaspoons of the olive oil, 1/4 teaspoon salt and black pepper to taste. 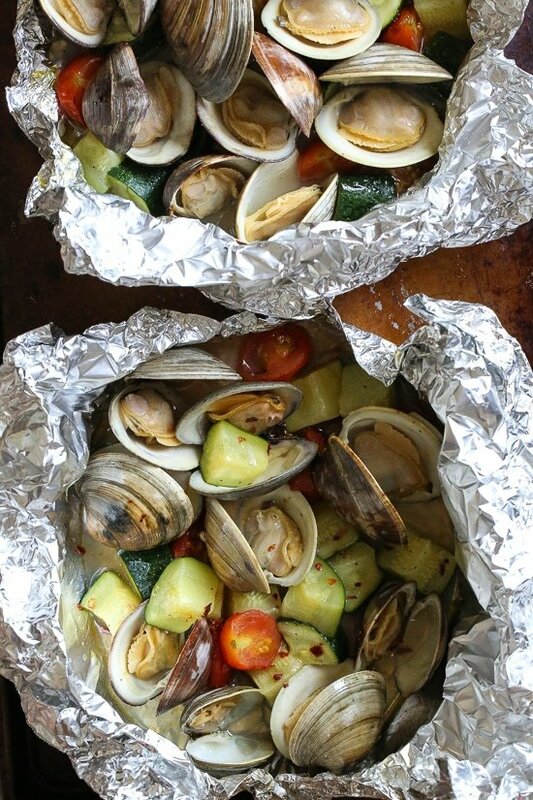 Place 10 clams on the center of each foil sheet. Divide the vegetables, then top with crushed red pepper flakes. Drizzle the remaining 1/2 teaspoon oil over each and 1/2 tablespoon wine over both. Bring up the long sides of the foil, so the ends meet over the food. Double fold the ends, leaving room for heat to circulate inside. Double fold the two short ends to seal the packet tight, so no steam escapes. Grill covered over high heat, until the clams open, 8 to 10 minutes. Use gloves or tongs to remove and carefully open. Eat right away! Disclosure: This post is sponsored by Reynolds. Thank you for supporting the brands that make Skinnytaste possible. All thoughts are my own. Made these the other night for my husband and I. They were simply delicious. Thanks Gina! These were so delicious! Used fresh clams plucked out of shinnecock bay and yellow squash out of my Uncle’s Garden …my first farm to table lol. Thanks again Gina for another great one! Made these and the shrimp scampi foil wrap and we loved it. Only issue were the vegetables were a bit soggy…any suggestions? This recipe was delicious. Even my teenage son, who never at clams before, loved it. I used non-stick foil and it worked out great. 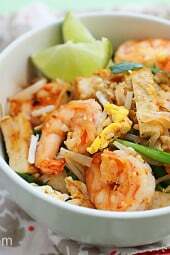 Excellent light and refreshing dish. My family was very impressed. We used the wine and it helped create a tasty broth that we will keep and use to saute vegetables for another meal later in the week. You can also use stock if you prefer, but the wine worked deliciously, so try not to omit. Directions need a tad clarifying though, probably a typo, but line four doesn’t say what half teaspoon over each, I assumed the remaining teaspoon of oil since we started with 3 teaspoons. Also, I used more cherry tomatoes than five, five didn’t seem to be enough and I’m glad I did. I’m nitpicking of course, this recipe is fantastic. I noticed that you say to cut 4 sheets of foil, however you only made 2 packets. Is this a typo or do you double your sheets for extra durability? Thank you. Great catch, it’s 2 pieces. Just made these in the oven. They are delish! It took a lot longer than ten min in the oven. Maybe I “foiled” them the wrong way. Nonetheless, they eventually opened! I made this last night for dinner! It was delicious! My husband thought it was great! Mine did take about 20 minutes on the grill for the clams to open up and the zucchini to cook. Will definitely make this again! Soak them in cold water for 20 min so they filter the sand out. After they are soaked, don’t strain them, lift them out of the bowl so you don’t pour the sand back over them. Then scrub with a brush and you’re ready to go. 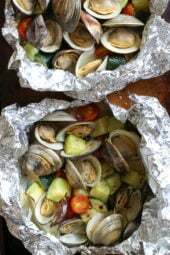 After they’d been in the oven for 10 minutes, I unwrapped one foil packet — clams not opened. After another 5 minutes, unwrapped it again — still not opened. Another 5 minutes, still not opened and the foil was in tatters. The heck with this: I opened both packets, dumped the contents (including the juice) in a high-sided frying pan, put on the cover and simmered them for 5 minutes. All done! Why bother with the messy foil thing that’s so hard to check? I’ll go straight for the pan next time.Also, I’d add some big chunks of onion cuz I found it a bit bland. It sounds like you didn’t have a good seal on the foil or the grill wasn’t hot. Hi, does this work for frozen clams in shell from seafood/meat section? Can you use frozen clams? I haven’t tried, let me know if you do. I love foil pack recipes! Keep ‘Em coming! Could I sub mussels for the clams in this recipe? Loved the Cajun Shrimp foil packets and want to try these! I am wondering how far in advance can these be put together and refrigerated without suffocating the clams? Same day would be ok but zucchini also releases a lot of water once cut so I would do it as close to cook time as possible. I made this last night, it was delicious and so quick and easy! I definitely agree with the crusty bread serving suggestion–the broth is amazing. I would really like to get some chicken breast recipes that are made in foil. Any ideas pelase. Hello! I am not a fan of zucchini, but would otherwise love to try this recipe. Which other vegetables could work in place of? Hi! 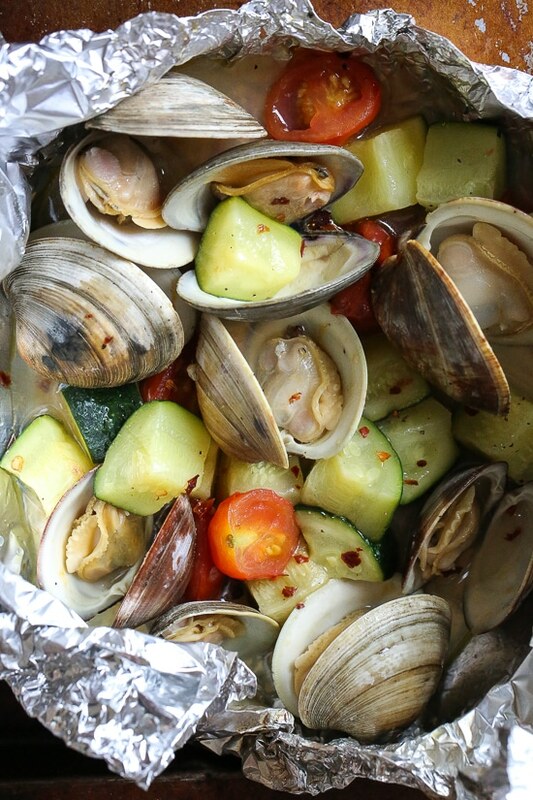 I just spent the weekend in Maine and can’t wait to eat more clams and this looks amazing!! I don’t have an outdoor grill, just a small indoor one that’s two-sided, like a panini press. Can I cook this using that? Or can I just steam it in a pot? If so, what are the directions? Thank you!! !